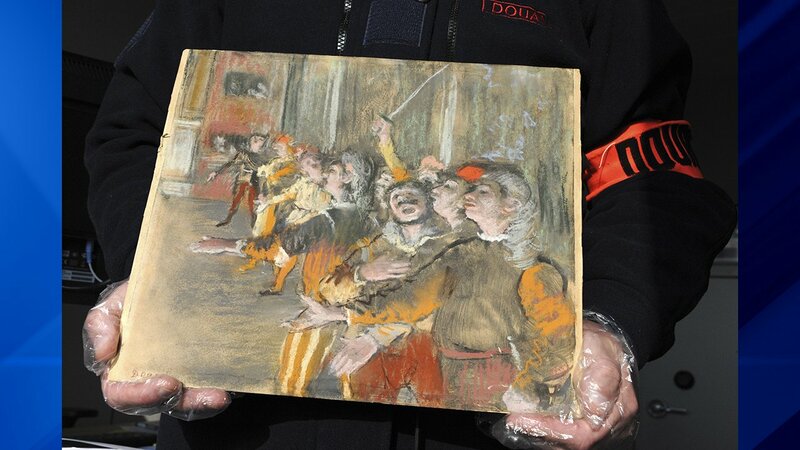 PARIS (WLS) -- French customs officers have found an impressionist painting by Edgar Degas stowed on a bus, more than eight years after it was reported stolen. The French Culture Ministry said Friday that customs agents in Marne-la-Vallee were surprised to find a work of art bearing the signature "Degas" inside a suitcase in the bus' luggage compartment. The ministry says none of the passengers claimed the suitcase during the Feb. 16 search. Experts verified the artwork as Degas' "Les Choristes" ("The Chorus Singers"), which depicts a scene from Mozart's opera "Don Giovanni." The painting was stolen from a Marseille museum in 2009 while on loan from Paris' Musee d'Orsay. French Culture Minister Francoise Nyssen said she was delighted by the recovery of a work "whose disappearance represented a heavy loss for the French impressionist heritage."